The Kumbh has started to reflect different colours of religion and tradition. What makes the Kumbh in Prayagraj distinct is the large congregation of Sadhus and their lifestyle. But this time, there is something different. 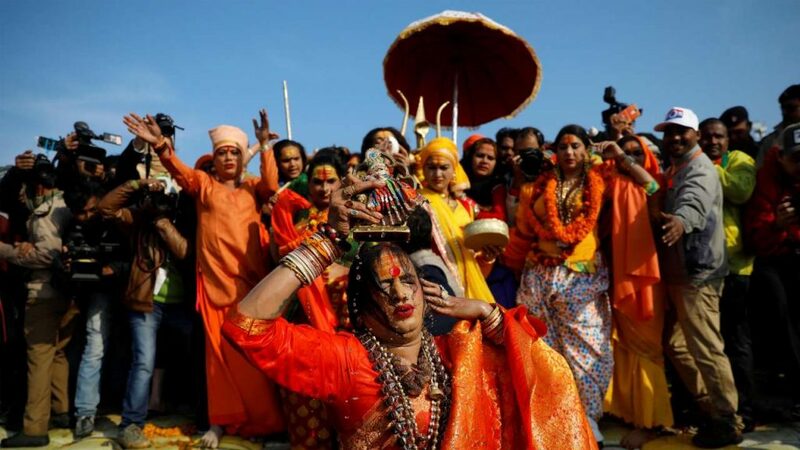 For the first time ever, the Kinnar Akhada, led by transgender activist Laxmi Narayan Tripathi, reached the Kumbh Mela in Prayagraj and took a holy dip in the ‘sangam’. However, the journey to the Kumbh hasn’t been easy for the transgender community. The first time the Kinnar Akhada ever joined the Kumbh was in Ujjain in April 2016. A sadhu blessing a transgender. Laxmi Narayan Tripathi has become the voice for the transgender community in india. Her struggles have brought a better status to her community. Laxmi says she has been through many obstacles in her life. She has been a model coordinator, a dancer, a social activist, and an actress. She has also been part of reality shows. She has been a writer too. She believes that despite being an Acharya Mahamandleshwar, her personality will not change. Along with the nagas, transgenders are also the attraction of the Kumbh. The ‘shahi snan’ that they have longed for has been the much-awaited moment of the mega event.